Excuse the pun, but I have to say it - I’ve gone nuts for nut milk, in particular, cashew nut milk. 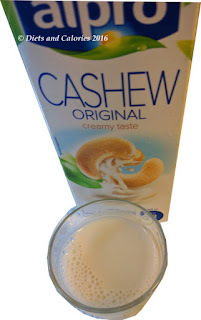 After enjoying the taste of PLENISH Cashew Nut Milk, I trawled the online supermarkets looking for other brands. And amazingly, just new in, is another offering from Alpro, who must be aiming to corner every variety in the nut milk market! Alpro Cashew Original 'nut milk' is available in the chiller fridges and has only 23 calories per 100ml. According to the information on the carton, Alpro’s Cashew Original nut milk has a creamy taste, is low in sugar, low in fat and is fortified with calcium, vitamin B2, B12 and Vitamin D. The reason for adding in additional supplementation is to help give nut milk a nutritional content similar to dairy milk. The carton is one the new style wider screw tops making it easy to open and pour without spilling the contents. I first tried drinking some on its own. Straightaway I knew I liked this one. Like the carton says, it is exceptionally smooth and creamy. The flavour isn’t obviously nut, but instead seems to have a mild sweetness all of its own. It tasted pretty good in my tea too. Next for the test was in my cappuccino. I always heat up my milk to make a frothy top. So far, I haven’t found any nut milk that produces a good thick and creamy froth. And again, I found the same for Alpro’s cashew milk. It did froth up, but the froth is a little thin and weak, and only managed to provide a thin layer of froth. Tastewise, I’d say it comes a close second to my usual Alpro Soya Light. Because the nut flavour isn’t strong, it doesn’t dramatically alter the coffee taste at all. Unfortunately, after heating, it did curdle in my coffee cup. This is only noticeable after leaving it for a few minutes. It doesn’t change the taste, but it certainly doesn’t look particularly appealing! It didn’t curdle in my tea, probably because I poured the nut milk in cold so the overall tea wasn’t hot enough to curdle it. It’s definitely more affordable than other nut milks on the market, costing around £1.80 for a 1 litre carton (although I have been purchasing it for £1 in Sainsbury’s). The other nut milk producers would probably say it’s because the actual nut content is lower for Alpro. This is true, to a certain extent. However, there isn’t a massive amount of difference. Alpro’s Cashew nut milk has 3.1% cashew nuts, Plenish Cashew Nut milk has 6% cashew nuts and Rude Health has 5%. Alpro does have the addition of gellan gum which is artificial and used as a thickener and stabilizer. This helps provide the creaminess and thicker pouring consistency. But, because of this, I'm more aware that the creaminess isn’t totally natural. I’d have to say I slightly prefer the taste of Plenish Cashew Nut milk and would rather purchase this one as it’s organic, contains only 3 ingredients and achieves a natural creaminess. But the higher price means I’ll only be purchasing it when on a special offer. For now, Alpro’s cashew nut milk is my go to alternative milk for use in smoothies, overnight oats and chia puddings. I also love the fact it’s so low in calories and I’ve been buying one or two cartons a week since my first purchase. Available in Sainsbury’s, Tesco, ASDA and Ocado Online. Contains Cashew Nuts, Free From Dairy, Free From Gluten, Free From Lactose, May Contain Nuts (I should hope so)! Nutrition Information per 100ml: 23 calories, 1.1g fat, 0.2g saturated fat, 2.6g carbs, 2.0g sugars, 0.2g fibre, 0.5g protein, 0.13g salt. Vitamin D 0.75ug, B2 1.80mg, B12 0.38ug, Calcium 120mg. Is your favourite the soya light uht long life or the light fresh one? I use the fresh one but it doesn't heat well either unfortunately!